Foreigners trying to learn English often have more trouble with our prepositions than with any other feature. But I see and hear so many awkward uses of prepositions lately that I think we all have more trouble with them than with any other feature–and more trouble than we used to. All kinds of new anomalies appear: sometimes merely the idiomatically awkward preposition is used, such as “comply to”; sometimes a preposition is used where none is needed, as in “This program affords for employee self-improvement”; and sometimes a preposition is used with a word when an entirely different word without preposition would be better: “Manufacturers consider styling paramount to safety” should end with “paramount” or should change to “consider styling more important than safety.” Some writers don’t appreciate the power of a preposition: allow for does not mean ‘allow.’ If we allow an applicant’s tardiness, we are more permissive than when we allow for tardiness, meaning that we take it into account, probably resentfully. The shortest prepositions cause the most trouble. Here are some examples collected from television, newspapers, textbooks, and business letters using for awkwardly: “All generals are advocates for military aid.” “We will forward the manual upon receipt for your check.” “What is your concern for the project?” means ‘What is your worry about the project?’ when the writer more likely means ‘What is your concern with the project?’ that is, ‘What do you have to do with it?’ “Friends sympathize for you in your troubles” needs with; for goes with sympathy. Affinity does not use for but with, since affinity means ‘kinship’ not affection or inclination. “Such a threat is an invitation for rejection” needs to. “They agree in principle for creating a new program” needs on or an infinitive. “Cutting the police budget will leave the citizens open for more crime” needs to. “Pretend that you are an employee for the company,” says a textbook writing assignment; of is idiomatic. Another short preposition used awkwardly is of: “We must alert citizens of the danger.” We may warn them of the danger, but we alert them to it. “We have set a limit of new proposals” needs on or to. “We are not as grateful of our health as we should be” needs for, although appreciative takes of. “They charged them of negligence” needs with, although accused uses of. “Sincere interest is needed of the student” needs from, although required takes of. “He cannot disguise his antipathy of the military junta in that country” needs toward, although dislike or hatred takes of. I suspect that the writer or speaker has both words in mind and carelessly combines one word with the preposition belonging to the other. 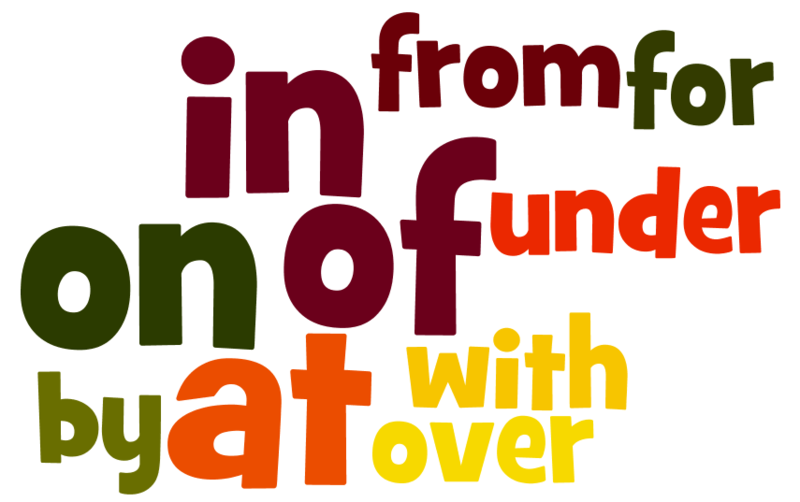 Some words give difficulty because they use different prepositions for different meanings. Immune, for example, is a troublemaker since it has become popular in figurative use. It takes to when we discuss disease, and so we can talk about “immunity to jet lag.” But when we discuss taxes or fines, we use from: “Kings and queens are immune from taxation” and “diplomats are immune from prosecution.” “Non-Indians Immune to Tribal Court” makes the headline say that the court is like a disease. Many words cause trouble because they use different prepositions in different constructions. “They made a mistake in [or by] turning right” changes if the article changes: “They made the mistake of turning right.” We may have a craving for affection, but we do not crave for affection: we omit the preposition when we change part of speech. “The decision to split the family temporarily was a matter for professional survival and challenge,” said a professor of English. It could be a matter for discussion, but it’s a matter of professional survival. If you share my pique, fight preposition pollution. Don’t let people express a predilection with; don’t let them look upon you for advice; don’t let them have an attitude over the project or unpack the contents on this package. Complain when the sports reporter asks the famous athlete whether he is a target by the police. Above all, don’t let rising costs stand in your way from achieving your goal, even if life does reek with politics and even if the earth does become barren from vegetation.